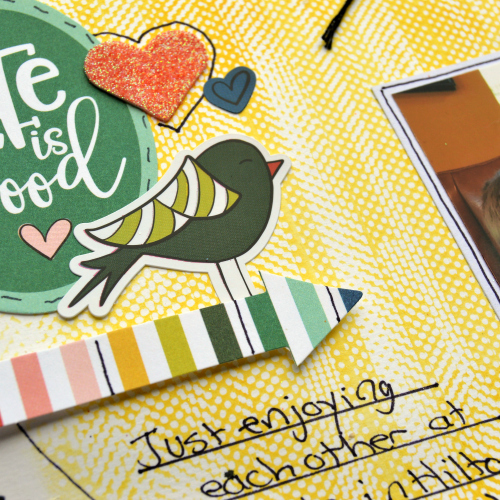 Few things are more enjoyable or satisfying in the scrapbook layout process than creating your own background. Especially when you get to use your adhesive in unexpected ways! Join me today as I walk you thru how to create a background using the E-Z Runner Grand with the E-Z Runner Repositionable Dots Refill. First up let’s take a look at the layout! 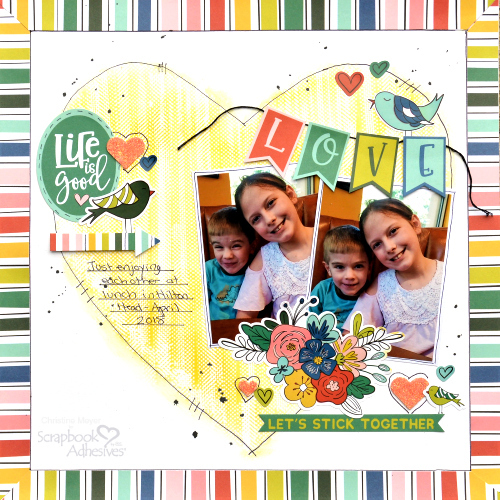 To make this background I used the E-Z Runner Grand Repositionable Dots and rolled it all over the inside of my heart. I then wiped Distress Oxides all over the top of it. After drying the ink, I took a wash cloth and wiped off all of the adhesive. That’s right, wiped off ALL the adhesive! In this case, the adhesive acted as a mask keeping the ink from going everywhere. To help all of this make a little more sense watch the video below. 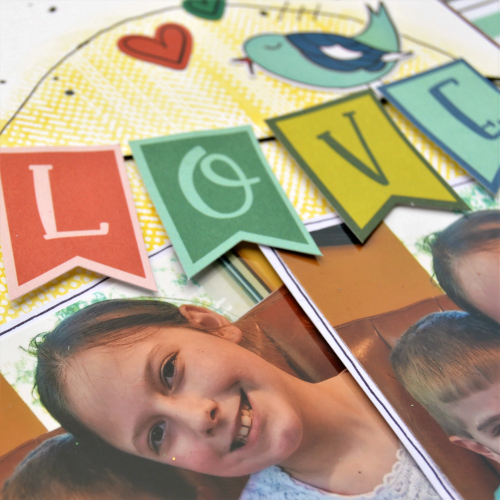 Now that you’ve seen how I used the adhesive to create a background, what else did I use? The E-Z Runner Grand Permanent Strips Dispenser did most of the heavy lifting. But the 3D Foam Squares White Regular also played a pretty big part adding dimension to several elements of the layout, including the banner shown below. Thanks so much for joining us today – I hope you feel inspired to try something new on your background for your next project! This entry was posted in 3D Foam Squares, Adhesives, Crafts & Tutorials, E-Z Runner® Grand, Intermediate, Permanent Adhesive, Repositionable Adhesive, Scrapbook Page, Scrapbooking, Skill Level, Tutorial and tagged 3D Foam Squares Mix White, 3D Foam Squares Regular White, Christine Meyer, E-Z Runner Grand Dispenser, E-Z Runner Grand Repositionable Dots Refill, Masking, Scrapbook Page, Video Tutorial. Bookmark the permalink. One Response to "Background Technique with the E-Z Runner Grand"
That’s such a fun technique and layout, Christine!